Micro Machine level interface and controller. Do you have screw compressors in your engine room that are mechanically sound but could really use a technological facelift? Do you think the cost-prohibitive proprietary controllers provided by compressor manufacturers represent your only option? Our eLOGIC Micro-System is designed to serve as an open-architecture NH3 screw compressor retrofit controller. 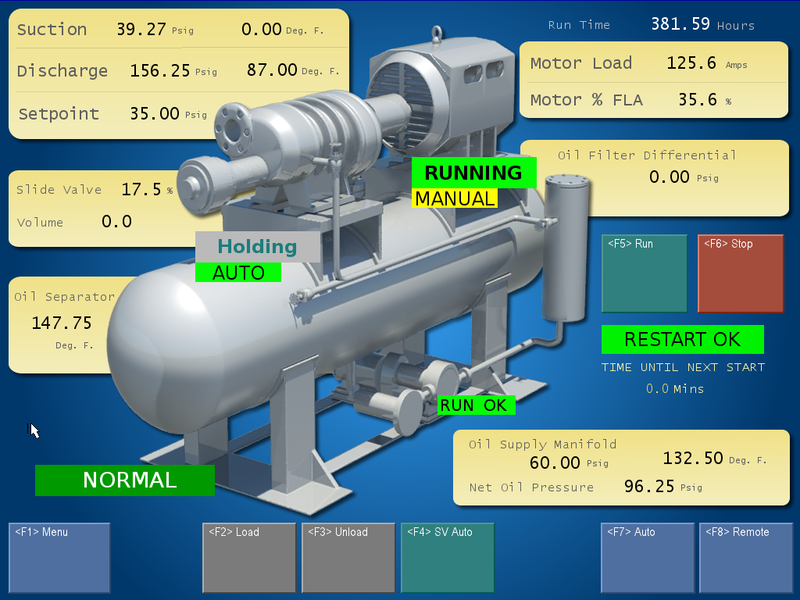 The system can be configured to control the operations of NH3 screw compressors produced by all major manufacturers. Since its inception, the controller has proven itself to be a viable option for all small to medium sized control systems due to the power and versatility of the design. Our open-architecture retrofit screw compressor control package is the solution you're looking for. The eLOGIC controller is based on our Signal Server Technology design platform and over 30 years of experience in the design, development, and implementation of scalable refrigeration control systems. - Quickly and easily configured to control most screw compressor packages. - Designed for use by refrigeration technicans, not computer programmers. - Built on the industry-standard PC104 buss architecture. - Support provided by the engineers that design and implement the systems. - Priced to fit your budget considerations.